"This category [science fiction] excludes rocket ships that make U-turns, serpent men of Neptune that lust after human maidens, and stories by authors who flunked their Boy Scout merit badge tests in descriptive astronomy." A device that could power a man from the surface of the Earth to that of the Moon. In the story, Cyrano resolves to visit the Moon, to test his belief that the Moon was a planet in its own right, just like the Earth. His first attempt at propulsion makes use of vials of dew, which when exposed to sunlight should bear him upward. 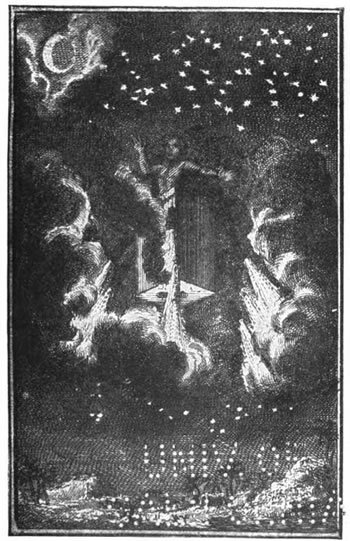 However, this effort was only partially successful; he ascended far into the sky, and then returned much later, after the Earth had turned under him, resulting in a landing in Canada. ...Then having taken a dram of Cordial Waters to strengthen my Heart, I went back to look for my Machine; but I could not find it, for some Soldiers, that had been sent into the Forest... had carried it into the Fort. Where after a great deal of guessing what it might be, when they had discovered the invention of the Spring, some said, that a good many Fire-Works should be fastened to it, because their force carrying them up on high, and their Force carrying them up on high, and the Machine playing its large Wings, no Body but would take it for a fiery dragon... I ran to the Souldier that was giving Fire to it... and in great rage threw my self into my Machine, that I might undo the Fire-Works that they had stuck about it; but I came too late, for hardly were both my Feet within, then whip, away went I up in a Cloud. From A Voyage to the Moon, by Cyrano de Bergerac. Cyrano eventually falls down to the surface of the moon, landing in a large tree which had broken his fall. This appears to be the first instance of the idea of a man-made propulsion system being used to power a craft from the Earth to another celestial body. However, I note that in his 1638 book The Man in the Moone, Francis Godwiin writes about a voyage to the Moon in a craft powered by Gansas, birds that annually migrated there. Thanks to christoph and others who wrote in with this suggestion.